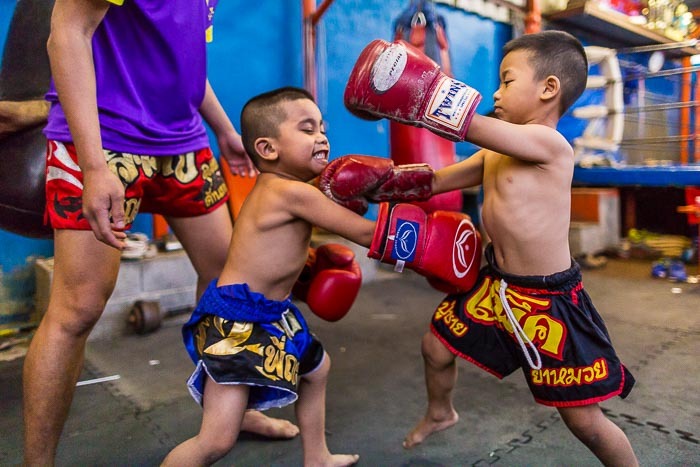 Boys spar at the gym along the railroad tracks near Wong Wian Yai Train station in the Thonburi section of Bangkok. I've resisted the urge to photograph Muay Thai since coming to Bangkok because almost every photographer who comes here does a boxing story. But I stumbled on a small gym in Thonburi, along railroad tracks in a working class neighborhood, open on one side. I went on a whim and liked what I saw so I started going back. A tiny boxer takes a tumble. Boxers, and aspiring boxers, gather at the gym every afternoon. The ones who are serious about boxing start their workouts by running. They run through the neighborhood for about an hour before coming back to the gym and jumping rope. 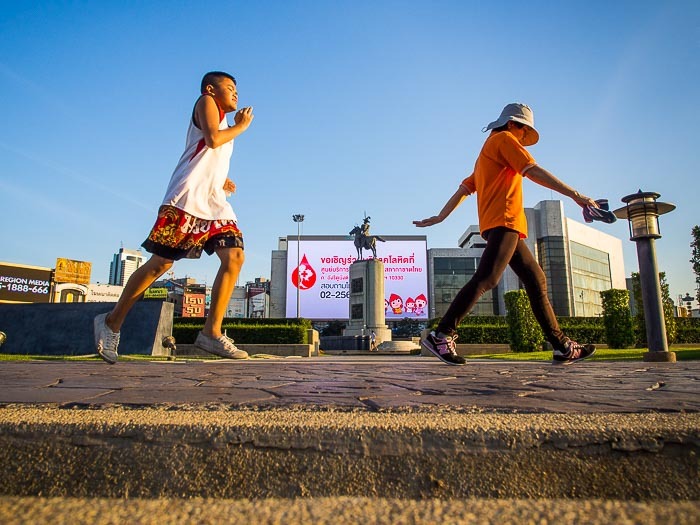 A jogging boxer passes an exercise walker at the Wong Wian Yai traffic circle. There are a few teenaged boxers at the gym but most of the people at the gym are children - kids under 10 years old who hope to box. 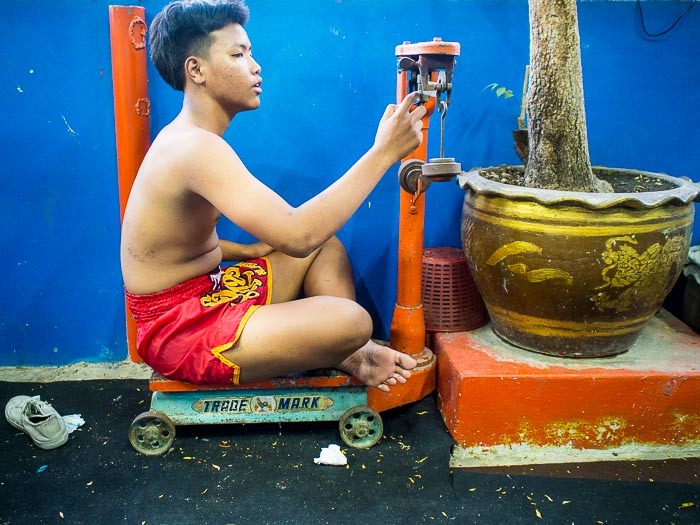 Muay Thai is one of Thailand's most famous sports. It's both a sport and a cultural tradition. Fights start with prayers and traditional music. It's seen as a path out of poverty. 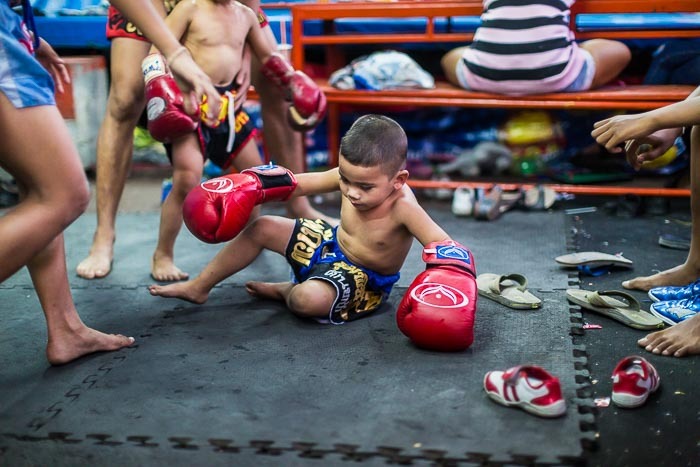 Professional boxers have rock start status in Thailand. Muay Thai is a form of mixed martial arts. Boxers use their fists, their elbows, their feet and knees. I don't really enjoy watching boxing, but Thai boxing is interesting. 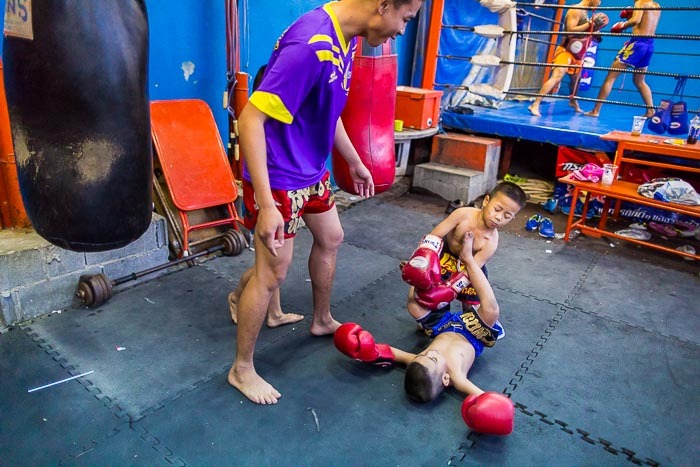 One of the "serious" boxers works out with an aspiring boxer. She's seven years old and has been working out at the gym, every day for four hours a day, for five months. She works out as aggressively as any of the older kids at the gym. The gym itself is barely a gym in the US sense of the word. It's open on one side. The train tracks are so close, boxers can practically reach out of the ring and touch passing trains. Spectators, who gather to watch the boxers, have to get off the tracks when a train comes. There are no weights, boxers use old car parts when they lift weights. The scale is an old railroad station scale. Boxers sit on it to be weighed. The weigh in before the work out. The gym is a great example of repurposing and recycling. Nothing goes to waste. There are more photos of the gym in my archive or available from ZUMA Press.